This sample comes from initial salvage excavations in the East Locus at Los Pozos. The reliability of this date has been questioned by Gregory (2001), and Mabry (2005:115) points out that there was no 13C/12C measure provided. Because the sample size was so small, extended counting was required. For these reasons, and because it is seven centuries earlier than the earliest of a suite of more than 50 subsequent AMS maize dates obtained from all loci at the site, we exclude it from calibration analysis (See also Merrill et al. 2009). 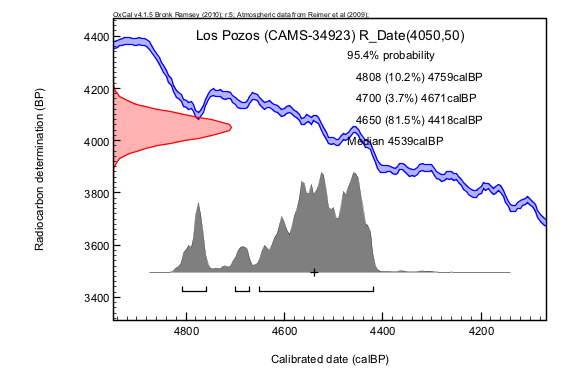 2001 Excavations in the Santa Cruz River Floodplain: The Early Agricultural Period Component at Los Pozos. Anthropological Papers 21. Center for Desert Archaeology, Tucson. 2009 The diffusion of maize to the southwestern United States and its impact. Proceedings of the National Academy of Sciences USA 106(50):21019-21026.